Before starting at Defra just over 6 months ago, I’d never been part of a Community of Practice. I joined the Delivery Managers Community soon after starting this job and it’s been a godsend. Previously I worked in a smaller organisation with a better all-round understanding of digital ways of working. Moving here was a big change: a new role in a much larger organisation, where the digital journey was younger and less well understood. It was a lot to take in, and having a group to welcome me and help navigate me through this new landscape was a big help. That might sound like it was just an induction, but a Community of Practice is so much more than that. There’s a vibrancy to the group because membership is voluntary. I'm not there because I have to be, I’m there because I want to be. That energy makes stuff happen. The draw is the opportunity to be with similarly passionate people who have something to give and something to gain. Whenever someone says: “I have an idea about something that might help solve a problem”, the typical response from the community is: “Great, go and work on that with our blessing.” In most cases, other members of the community will step forward at that point and offer their help too. Suddenly I'm not alone, I can influence stuff. The Community gives me a voice, and it gives me power to change things. Over the last 6 months or so, the Delivery Managers Community has been acting as a single voice on issues which affect all the DMs across Defra. We made a point of welcoming the new Head of Role for DMs, and a job-sharing pair of Chief Digital Officers when they started their jobs in recent weeks. To each of them, we were able to speak as a unified group with requests and offers of help. When we want to influence something, we try to work together to make sure we agree on the issues and on our suggested fixes. For example: David Thomas’ recent blog post on funding teams not projects got a lot of comments and attention on Twitter. The post itself grew out of a number of conversations within the DM community. Speaking with one voice like this gives us more power, and encourages us even if the things we wish to influence may take a long time to change. We continue to talk about how we can be seen to speak as a Community, rather than individuals. I think that change is happening organically; when any of us raise a suggestion or issue, our colleagues know that members of the community have already talked about it together and tried to find solutions ourselves. I am fortunate that I work in Bristol and there are 5 other delivery managers there. This makes collaboration much easier and our formal Community of Practice meetings are supplemented by ad-hoc conversations along the way. We have further to go as a community to address how we can adequately help colleagues who might be the only DM in their part of the Defra group, or in the building where they work. We use Slack, have a weekly ‘stand-up’ and periodic face-to-face meetings, but it inevitably takes longer to build community when you are remote. But that is the reality of the Defra group and the presence of a virtual community is better than no community. I’d echo what our joint Chief Digital Officers wrote a few weeks ago: communities are positive forces for change, and can be a huge help for those of us busy trying to get things delivered for users. 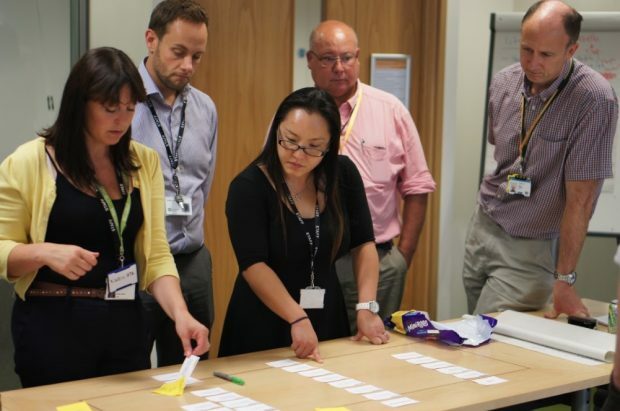 How do I join the Defra deliver manager's community, please? Hi James, you can contact me via email or slack. I will then set you up with the info you need such as stand-up invites, our communication channels and our next face to face meet up. You can also follow our activity on Yammer (there is a Community of Practice channel and a delivery manager one).